Thousands of people marched through cities in Morocco on Sunday either to protest or to support constitutional reforms proposed by King Mohammed in reaction to unrest inspired by “Arab Spring” uprisings in the Arab world. Critics of the reforms says they do not go far enough to reduce his powers. The march against the monarch’s measures was the latest in a wave of marches in the North African state and comes days before a July 1 referendum on the reform plan. “We reject the offers made (by the king). They keep the essence of authority in the hands of a non-elected person who will not be subject to any form of accountability,” said Hamid, a jobless 38-year-old among 7,000 protesters who marched through a working class suburb of Casablanca, Morocco’s largest city. Aziz Yaakoubi, a member of the street movement, said two protesters were injured after being pelted with stones by a group of rival demonstrators in favour of the king’s reform. The 47-year-old king’s move to reform were in reaction to some of the largest street protests the Arab world’s longest-serving dynasty has seen for decades. His fortunes are being watched by other monarchs, notably in the Gulf. The new charter still allows him to name a prime minister — but this time only from the party that wins most seats at parliamentary elections — and to vet appointments of other ministers and suggest the termination of their mandates. It explicitly grants the government executive powers, but it keeps the king at the helm of the army, religious authorities and the judiciary and still allows him to dissolve parliament, though not unilaterally as it is the case now. The Moroccan street movement — dubbed “February 20” after its founding date — has not won the mass support that toppled leaders of Tunisia and Egypt and does not demand an end to the monarchy. It focuses instead on the king’s perceived growing business influence and his tight grip on the political system. National income per head in Morocco was $2,810 in 2009, according to the World Bank, higher than Egypt’s $2,070. But Morocco ranks 13 places below Egypt at 117th in the United Nations’ Human Development Index, a measure of quality of life based on factors such as child welfare and life expectancy. “Surely there is graft and a lot of oppression. 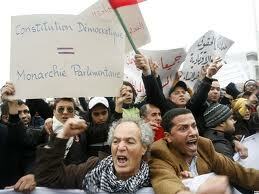 But the new constitution will change everything,” said 19-year-old Casablanca resident Karim Azhari. A smaller rally of about two thousand people opposed to the king’s proposals marched through the capital Rabat, separated from rival marchers by dozens of baton-wielding riot police. “February 20, Game Over!” read the placard of one pro-monarch demonstrator. Authorities on Friday ordered mosque preachers to urge worshippers to vote for the reform, saying it would be unIslamic to disobey the king, described in sermons as “God’s appointee”. Mustapha Nazih, a cleric at a pro-reform march in Casablanca organised by Boutchichiya Zawiya, one of Morocco’s biggest and wealthiest sufi schools, said he had come all the way from the town of Beni Mellal, 300 km (190 miles) from Casablanca. “We didn’t have to pay for the bus fare. The Islamic Affairs Ministry asked us to come to Casablanca and we did so happily.